How to perform Hanuman Jayanti Pooja? “We bow to Maruti, Sri Hanuman, who stands with his palms folded above his forehead, with a torrent of tears flowing down his eyes wherever the Names of Lord Rama are sung". The birthday of Lord Hanuman falls on Chaitra Shukla Purnima (the March-April full moon day). This day is marked with devotees keeping fast, reading Hanuman Chalisa and spending the day in Rama Nama Japa. The important days for worshipping Hanuman are Saturday, Tuesday and Thursday. Monday is especially auspicious Lord Shiva. According to a legend, when Shani (Saturn) approached Hanuman to bring him under his spell, Hanuman got him by the hair, dangled him in the air and blew air on him. He then let Shani go only after a promise from him that he would never harm him or his devotees. Hence, for those who have Shani (the seven and a half year period), it is good to worship Hanuman on Saturdays. Others can worship on any of the three mentioned days to their convenience. The story goes that when Hanuman conveyed the message from Sri Rama, Sita Devi garlanded Hanuman with a betel vine as a token of her joy and appreciation, as she could not find any flowers nearby (in Asoka van, Lanka). Anjaneya may be worshipped with jasmine flowers or Tulasi on Thursdays. It is believed that Hanuman prefers to frequent places where there are beautiful and fragrant flowers. Hence Parijatam, which is considered as one of the most fragrant flowers, is offered to him. Tulasi is the favorite of the Lord Rama, and hence also a favorite of Hanuman. Lotus is also dear to Sri Rama. In the only temple dedicated to Bharatha, the younger brother of Sri Rama, in Irinjalakuda in Kerala too, garlands made of lotus are used. 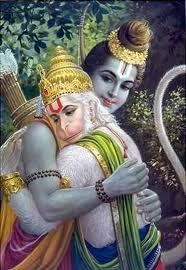 Sri Rama had equal affection for his brother Bharatha and Sri Hanuman. Lotus is also used for worship in Vishnu temples. Lord Krishna is also called the lotus eyed (Pankajaaksh). Hence lotus is also a favorite of Hanuman. Hanuman Mukha, facing East, removes all blemishes of sin and confers Chitta Suddhi. Karala Ugravira Narasimha Swami, facing the South, removes fear of enemies and confers victory. Mahavira Garuda Mukha, facing West, drives away evil spells, black magic influences etc., and removes all poisonous effects in one's body. Lakshmi Varahamurthy facing North wards off the troubles caused by bad influences of the planets and confers all prosperity-Ashta Aishwarya. Hayagriva Mukha, on top, confers knowledge, victory, gnana, good wife and progeny. After finishing Hanuman jayanthi Pooja (Shodashopacharam) we can continue with Hanuman AshtottraShataNamavali.